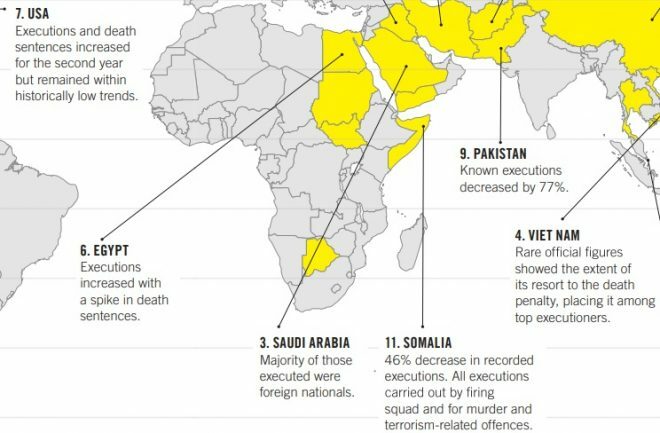 Global executions fell by 31 percent last year, the lowest in a decade, but that trend didn’t entirely hold in countries across the African continent, according to a new report from Amnesty International. Five African Union member nations carried out known death-penalty executions last year, including Botswana, Egypt, Somalia, South Sudan and Sudan. While there’s been a drop in cases in Somalia, the executions have increased in South Sudan. In the Middle East and North Africa (MENA) region, Egypt accounted for 61 percent of all new death sentences with at least 717. That’s among 19 nations in the group, which saw an overall drop in executions in 2018 because of decreases in Iraq and Iran. “Since 2014, under the administration of President Abdel Fattah al-Sisi, Egyptian ordinary and military courts have handed down at least 2,000 death sentences, mostly related to incidents of political violence,” the Amnesty report said. The NGO finds that in some cases – notably those in relation to crimes such as terrorism, incitement of violence and “political violence” – those convicted could not have committed the offenses because they were already in Egyptian police custody when the crimes allegedly occurred. Sudan and Botswana, the only southern African nation to record an execution, did so after having no death penalty cases the previous year. Mauritania and Nigeria expanded their death penalty laws, with Nigeria having the most people (at least 2,000) under a death sentence last year. The Gambia and Burkina Faso moved toward restricting or abolishing theirs, while Benin commuted the sentences of the last 14 men held for up to two decades. Overall cases in sub-Saharan Africa were down because of decreases in Somalia, but the rise in South Sudan remains cause for concern. About three dozen African nations either have no death penalty, or are de facto abolitionists because they have not used it in 10 years. China remains the global leader in such executions, followed by Iran, Saudi Arabia, Vietnam and Iraq.